The Isle of Man Steam Packet Company (IoMSPCo) is a passenger shipping company. The company is the oldest continuously operating passenger shipping company in the world, it will be celebrating its 190th anniversary in 2020. The company operates regular ferry and fast ferry services that connect the Isle of Man to Heysham, Liverpool, Belfast, and Dublin. It carries passengers, cars, and motorcycles. The Isle of Man Steam Packet Company Limited was formerly known as Mona’s Isle Company. The company was founded in 1830 and is based in Douglas, Isle of Man. Both vessels and crews of the company were actively involved in both the First and Second World Wars. During the First World War, eleven out of a total fleet of fifteen Steam Packet ships were requisitioned by the Admiralty. Four of them were lost, three retained by the government and four returned to service. In the Second World War, ten of the fleet of sixteen ships were commandeered for active duty, four of which were lost. The Dunkirk evacuation was perhaps the company’s finest hour, with Mona’s Isle (IV) being the first to leave Dover and the first to complete the round trip during the evacuation. Eight company ships took part in this mission, rescuing a total of 24,699 British troops – one in fourteen of those evacuated from Dunkirk. However this was also saw the company’s blackest day, as three of the line’s ships were lost. The 1980s were tough for the company, with declining passenger numbers. Strong competition from Manx Line brought the company close to financial collapse. In February 1985, a merger with Sealink (who had now taken over Manx Line) was announced. 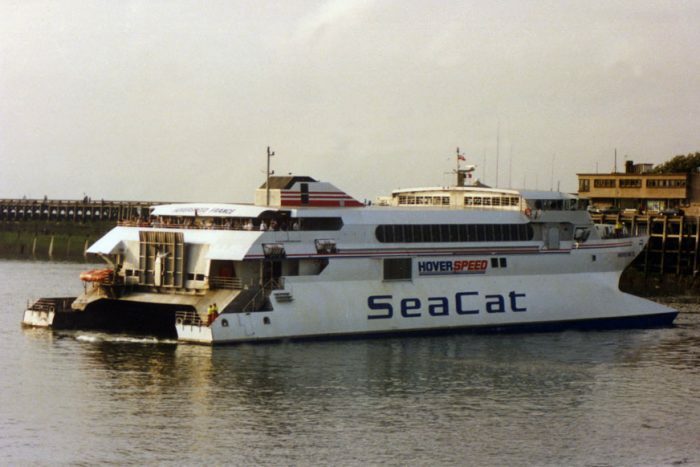 Manx Line, as part of Sealink, was later sold to Sea Containers Ltd, and became the vehicle for a reverse takeover by SeaCo of the Steam Packet Company, so consolidating the two Manx businesses. In 1996, the Steam Packet Company became a wholly owned subsidiary of Sea Containers Ltd. In July 2003, the company was sold for £142 million to Montagu Private Equity. In 2005, the company was purchased by Macquarie Bank for £225 million. Ownership changed again in 2011, the new owners being Banco Espírito Santo.